If you love your bite of umami you gotta love chicken. Lean, clean (mean machine!) and delicious its perhaps a non vegetarian's most loved protein. Boiled, broiled, baked or fried, its a universal partner for a plethora of ingredients and is always at the top of my indulgences, meaning I'm not too fond of eating non vegetarian fare but a juicy chicken anything is kinda hard to resist. Growing up we had a small little take away joint in our neighbourhood that sold the yummiest chicken cutlets that I can recall and come 4 pm as soon as I got off my school bus I would make a pit stop at the shop and pick up a chicken cutlet and a piece of pao (dinner roll) the usual post school faves read, Lays chips, colas, chocolates, ice cream sticks be damned. Now sorry for throwing these rain filled days at you at every post, but they do beckon me again and again to raise my backside and fry the living day lights out of all possible food, the caveat?, the man of the house, who doesn't enjoy either fried food or veggie snacks... so what does a gal do?, ah ha make a small batch of quickly doable Chicken Fritters of course! 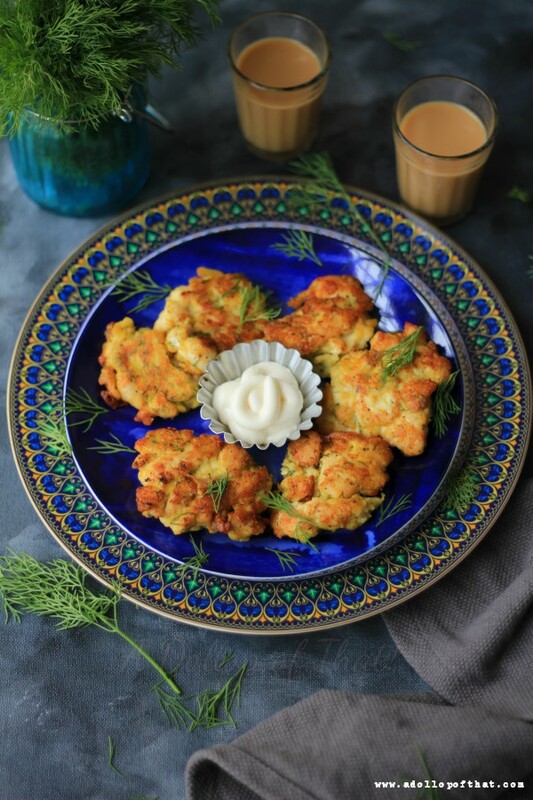 Chicken Fritters are a surprising way to use chicken breast, but it really works. 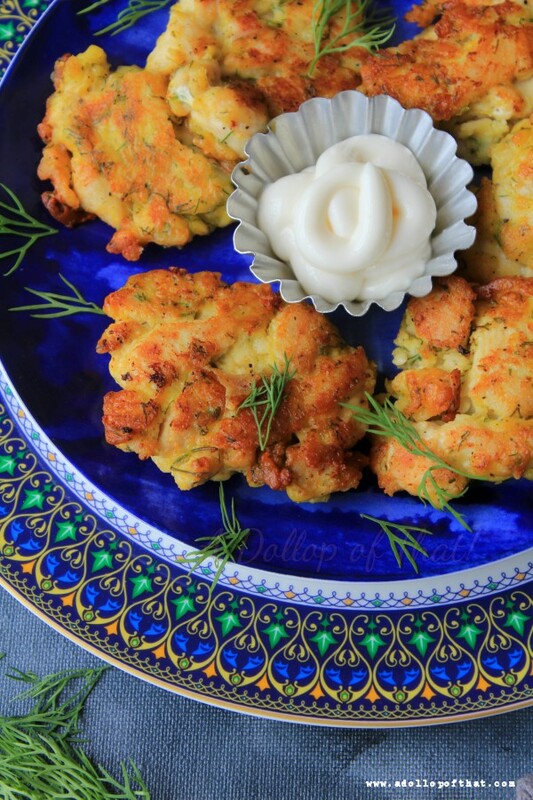 These fritters are tender, juicy and so flavorful. If you love easy chicken recipes, THIS is for you! 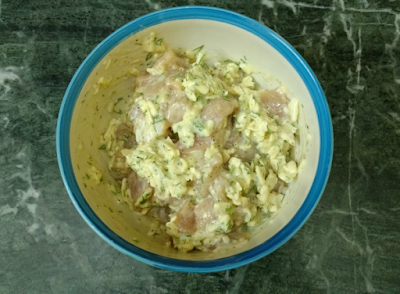 Finely chop the chicken breast into small cubes and put in into a mixing bowl. 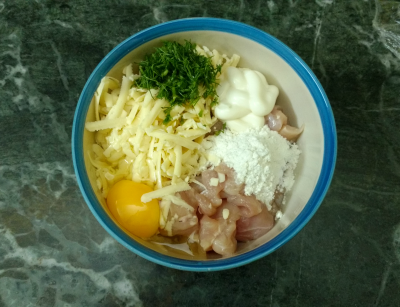 Next to the bowl add in the flour, salt, pepper, mayo, cheese, dill and egg. Now cover the bowl with cling wrap and refrigerate for a minimum of two hours or even overnight. When ready to fry, heat some oil in a pan and add in dollops of the mixture using a tablespoon for measurement. Fry for 4 mins on each side. Remove and drain the excess oil on a kitchen towel. Serve alongside your favourite dipping sauce and enjoy the pitter patter against your (or your neighbors' perhaps) tin roof. thanks for lovely recipe...i shall try it soon..i love the way you post your recipes with a zing of flashback and wittyness.